Eye Candy centers on tech genius Lindy, who is persuaded by her roommate to begin online dating and begins to suspect that one of her mysterious suitors might be a deadly cyber stalker. When her friends at the elusive cyber-police uncover a potential serial killer in Manhattan, all signs point to one of Lindy’s dates. Teaming up with this band of hackers, Lindy works to solve the murders while unleashing her own style of justice on the streets of New York City. The following are examples of Out of Home creative that Michelle Russel and I made for the promotion of the MTV original series Eye Candy. We made taxi tops and out door billbaords. 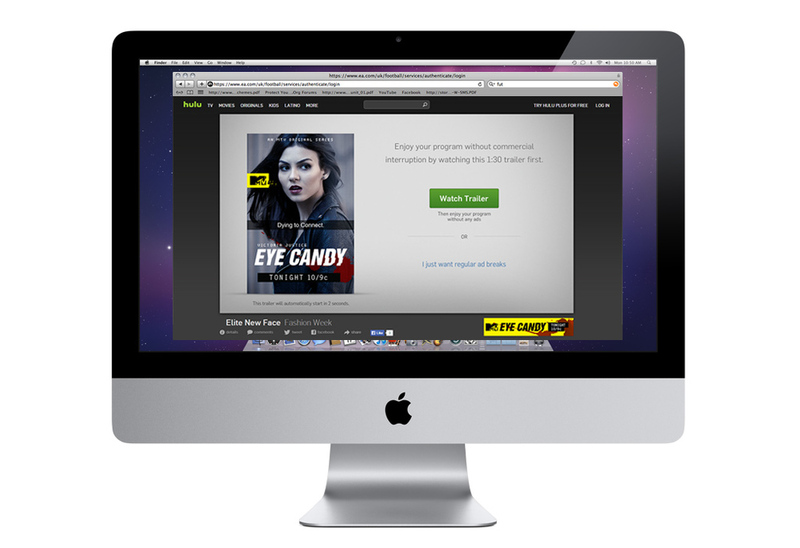 The following are samples of the digital campaign that Michelle Russel and I made for the promotion of EYECANDY. Below you can find a video of our day of takeover of TMZ which engaged the viewer by taking over their web browser followed by the promo video and finally ending in our page takeover. There are also examples of web banners, Hulu digital ads and posters, as well a mobile unit which set a reminder on user's phone of show's premiere date and time.